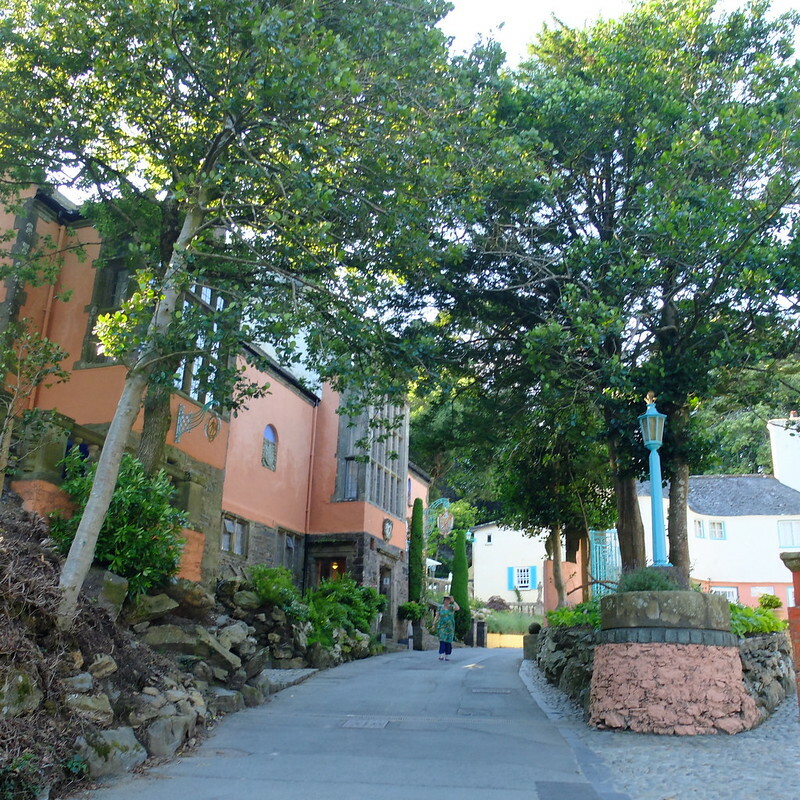 Following my post about dawn at the estuary, here are some more photos of the wonderful private village of Portmeirion in North Wales. 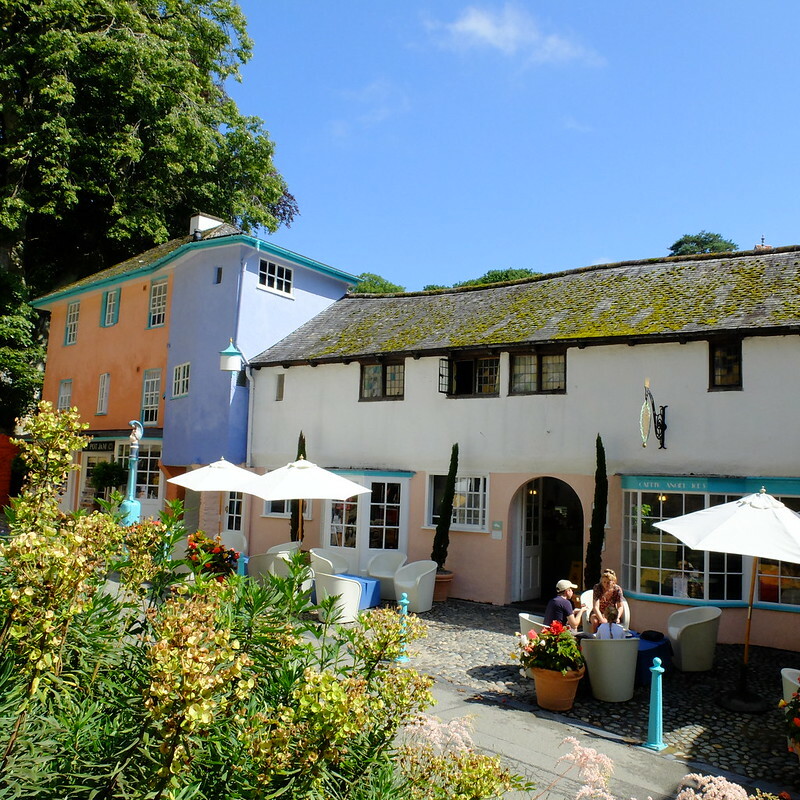 For those not familiar with the history, the village was the dream of a chap called Clough Williams-Ellis, who painstakingly brought his vision to life over the decades from 1925 until his death in the late 1970s. 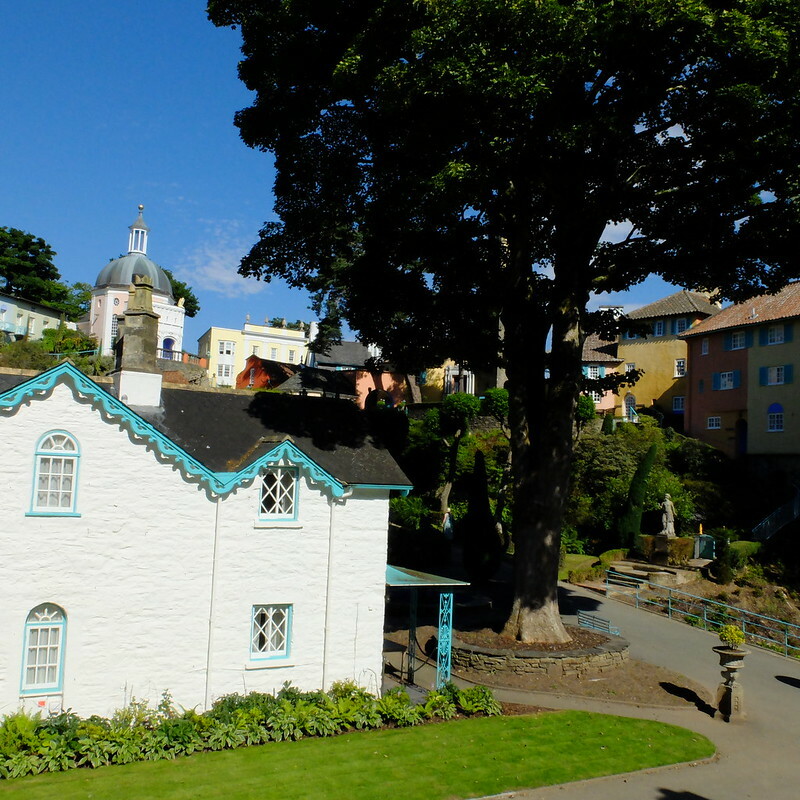 It's a complete indulgence, all this Italian style architecture in the far North of Wales. Today it's owned by a charity, and day visitors can pay an entrance fee to explore the village for the day. 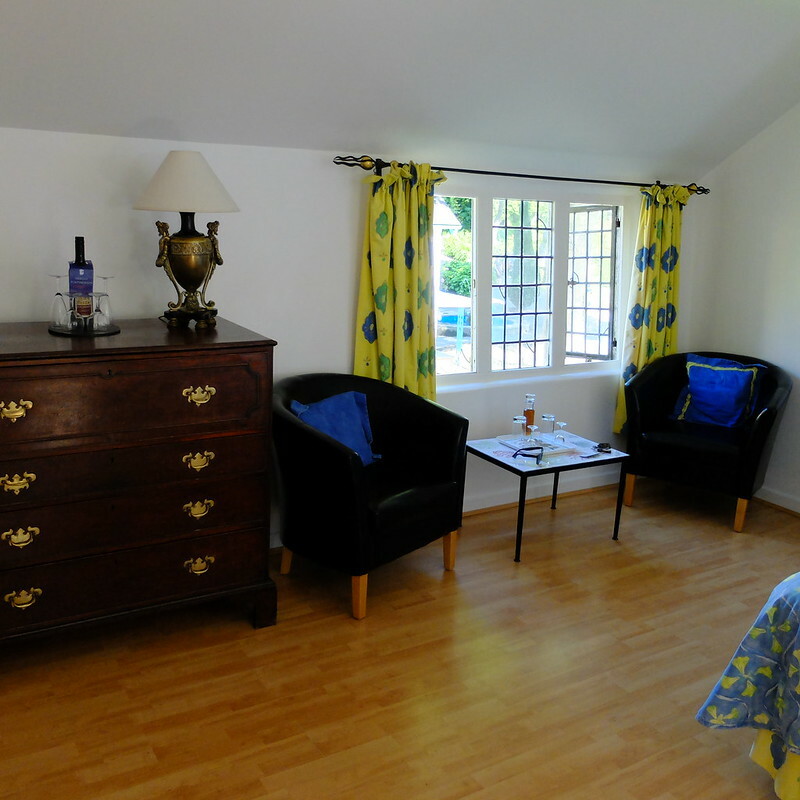 Alternatively, you can pay (fairly heftily) to stay in the guest accommodation on site. 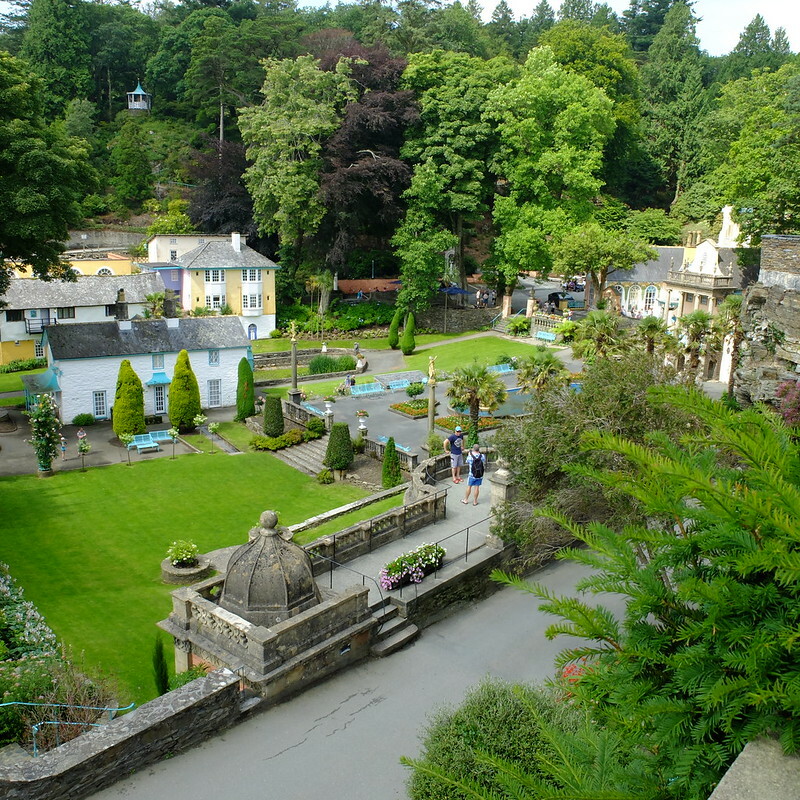 There's the main hotel building, the village buildings, and the castle further up the hill. 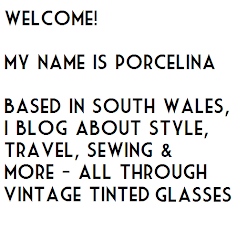 As we were travelling a fair way from South Wales, I decided we should definitely stay. We couldn't have timed it better with the weather - arriving in 31 degree heat, it felt like we'd stepped off a plane rather than out of my car! First stop then was a dip in the pool, which is heated these days, a step up from when there would have been a bracing freshwater pool in the 1920s. The pool is small but was just what we needed after a 4 hour drive in warm weather, and feeling refreshed, we explored the village a little. It's a compact site, centred around some beautiful gardens. There are lots of little shops and places to eat, including a 'diner' style cafe in the Town Hall, and an ice-cream parlour. 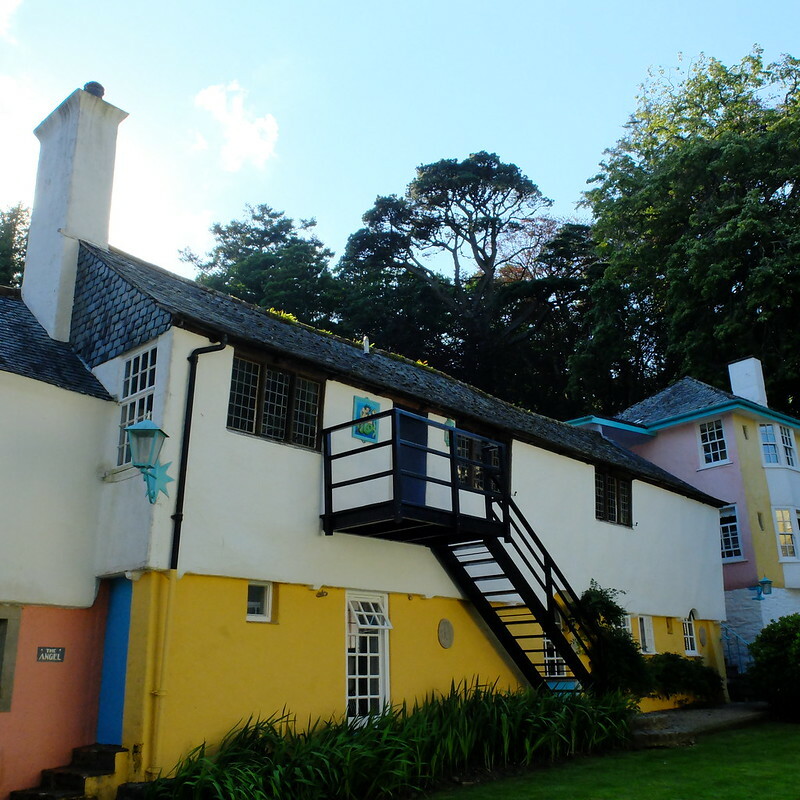 If the filming of the 1960s TV series 'The Prisoner' interests you then you can visit the gift shop, which I think was Number 6's cottage in the programme. The village is surrounded by woodland, and there are lots of paths veering off if you're feeling exploratory. You'll come across little follies and look-out points if you do. 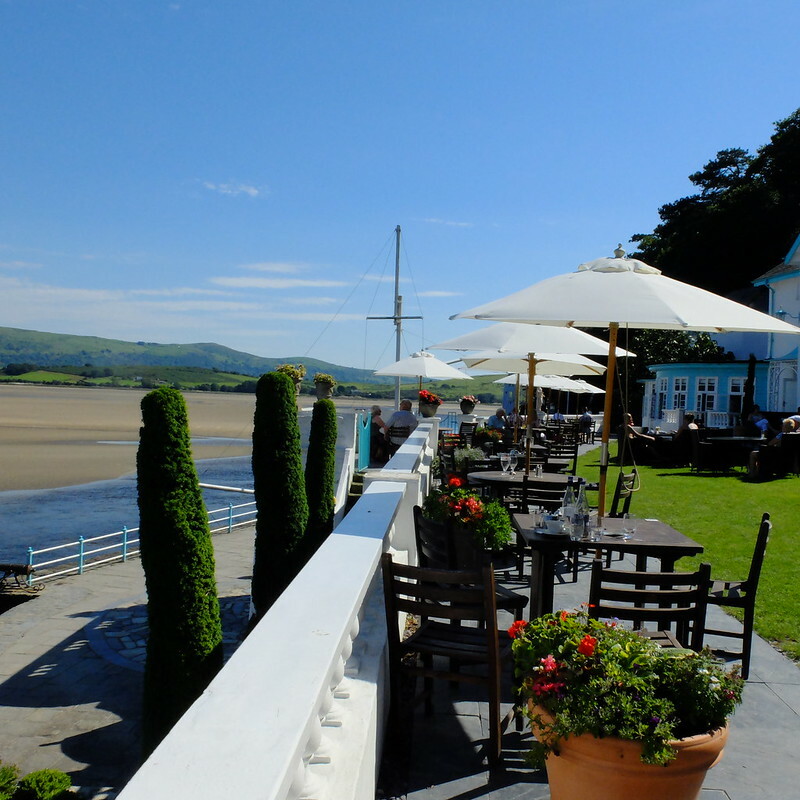 After a quick change, it was then time for drinks on the hotel terrace, followed by a picnic overlooking the estuary. Apparently the restaurant is top-notch, but it is pricey, and we were a bit too hot to sit inside for a formal dinner. We had cold salmon and salad off plastic plates, washed down with some wine. Classy! Breakfast the next day was a very good experience. 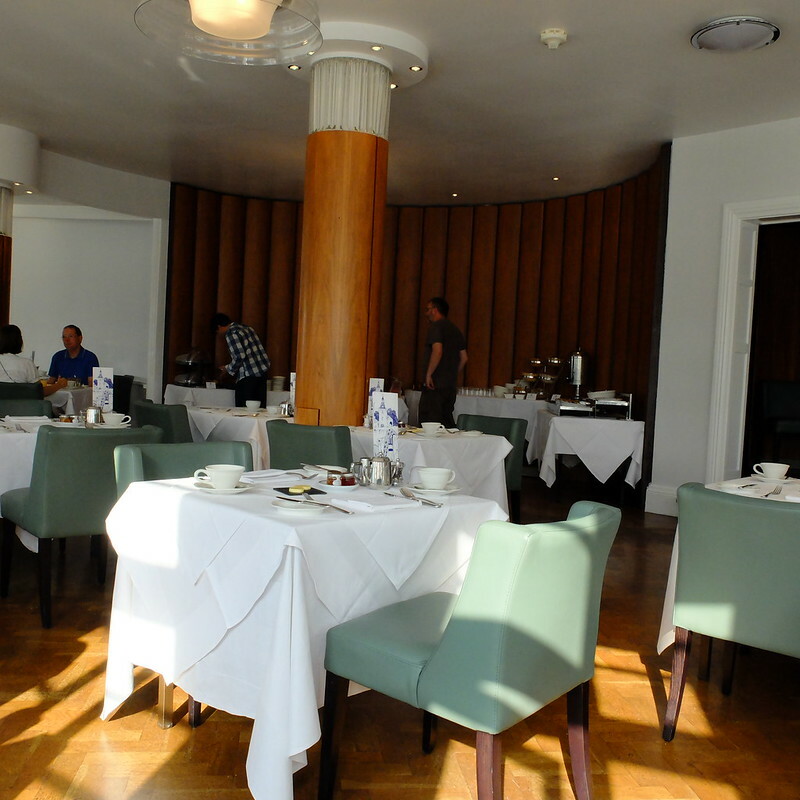 The beautiful 1931 Art Deco dining room (redesigned by Terence Conran in 2005) is the perfect spot to drink tea and look out over the estuary through the curvilinear windows. Breakfast was superb and we stuffed ourselves silly. It wasn't perfect, I have one main gripe with our accommodation. You'll see what I mean in the next photograph. 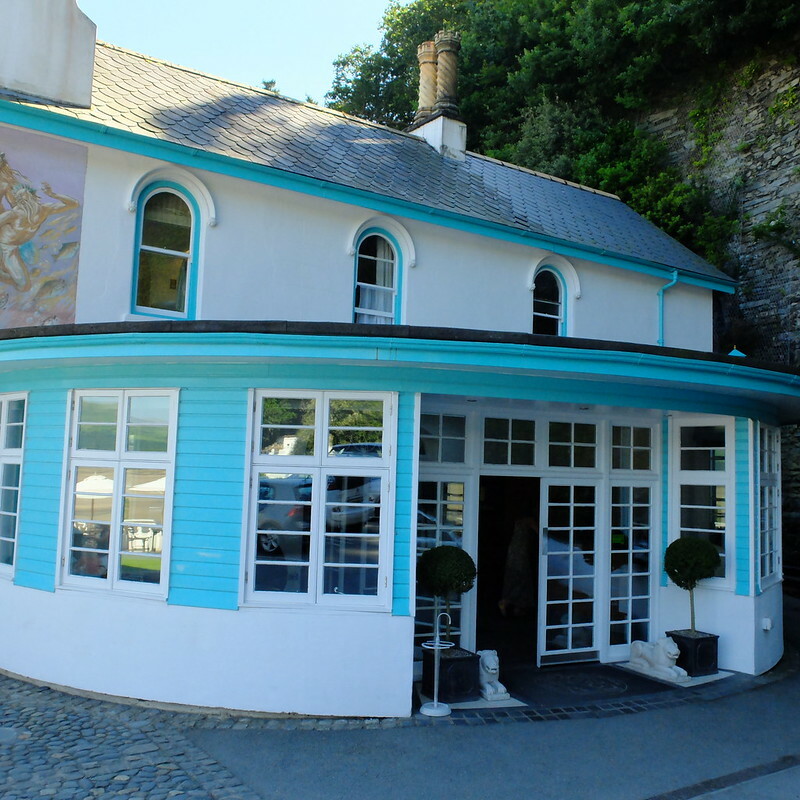 We were accommodated in 'Neptune 1', a standard double room in the village, in a little wonky looking building. What a sight greeted us on opening the door to the room - quite possibly the most hideous décor I've ever seen in a hotel room. Blue and yellow fabric, everywhere. It was like the 'Changing Rooms' team had done it out in the '90s. I could almost visualise Laurence Llewellyn-Bowen. The room itself should have been charming - it's spacious, has a nice dressing table and desk, and the bathroom and little sink area are done out well. 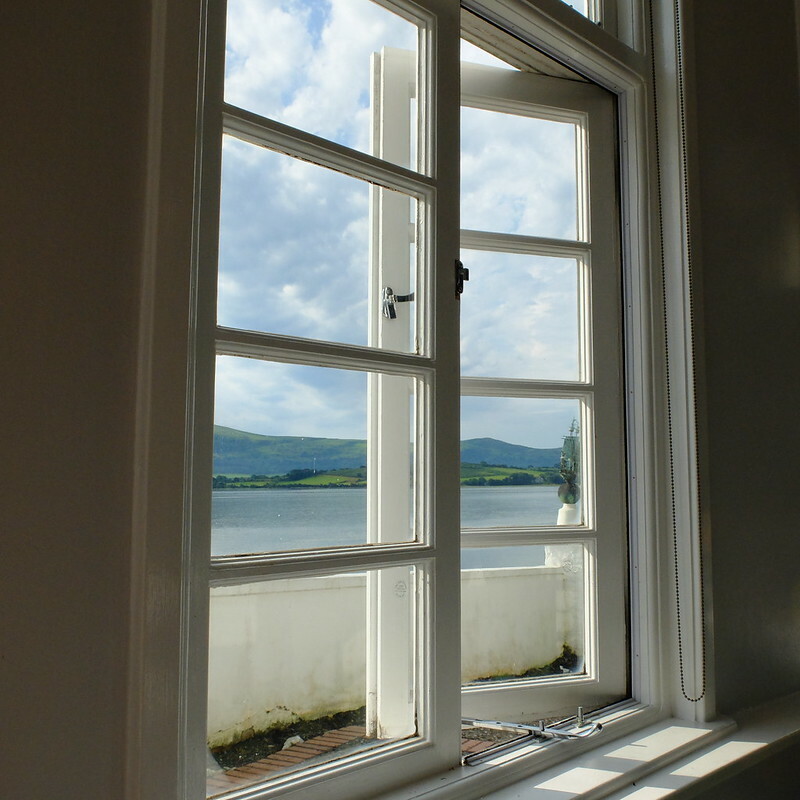 There are pictures of birds, and a little table by the window with chairs, Portmeirion pottery tiles in the bathroom, and complimentary sherry. But that bed and drapes? What were they thinking?! At least the view from our room was nice, across the village. I did complain about the décor at reception, and was told that gradually the rooms are being redecorated. Apparently the ones that have been done out are looking swish, with floating beds and such. I do hope that they make more of the Art Deco connection and play on that a bit more in general - not a hint of any Art Deco inspired gifts in the on-site shops, which was a shame. The National Trust have cottoned on to people's love of Art Deco with their impressive range of Deco inspired gifts that they sell in their shops. 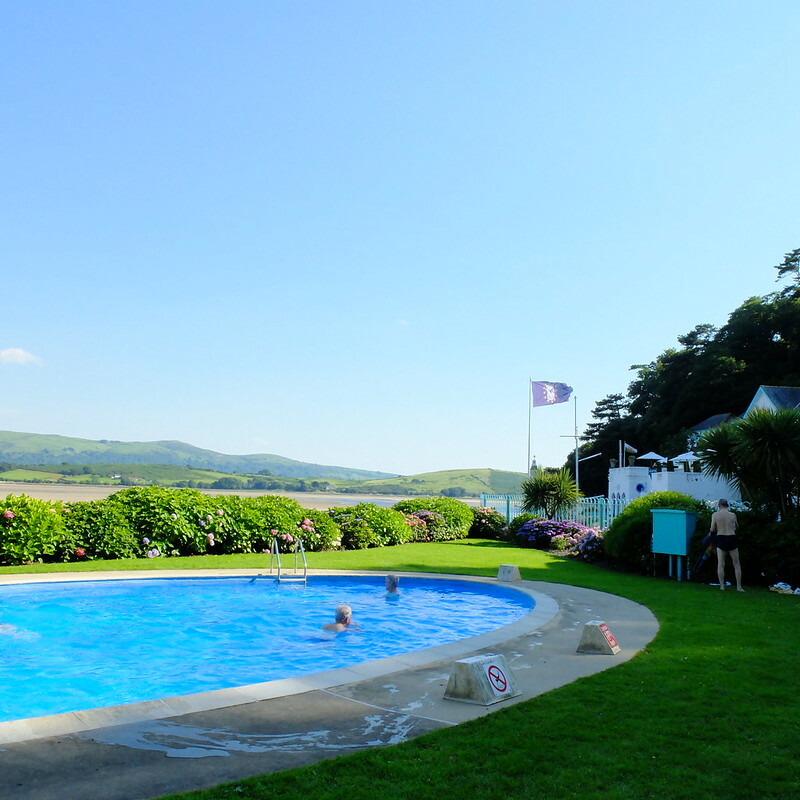 Let's hope Portmeirion can do the same. The other thing I think is missing is some kind of tourist centre or exhibition as a starting point. 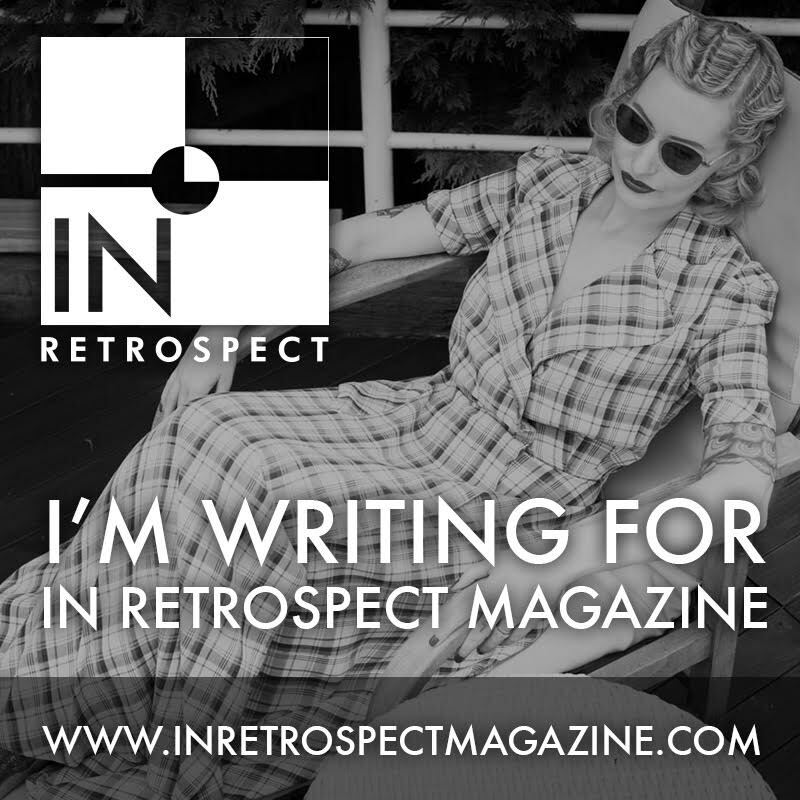 We sort of gleaned bits and pieces of information as we went around, about how the site was built, and its connection with TV series such as The Prisoner. I must admit I like a proper exhibition with lots of photographs and models. Perhaps they don't have room for one, it's a small site and it looks as though every bit of space is being used for either accommodation, shops, eateries, or for events like weddings. Anyway, we have come away with some fabulous memories of this truly exceptional place. What an experience! If you ever get the chance to go - and to stay overnight - I would wholeheartedly recommend it. 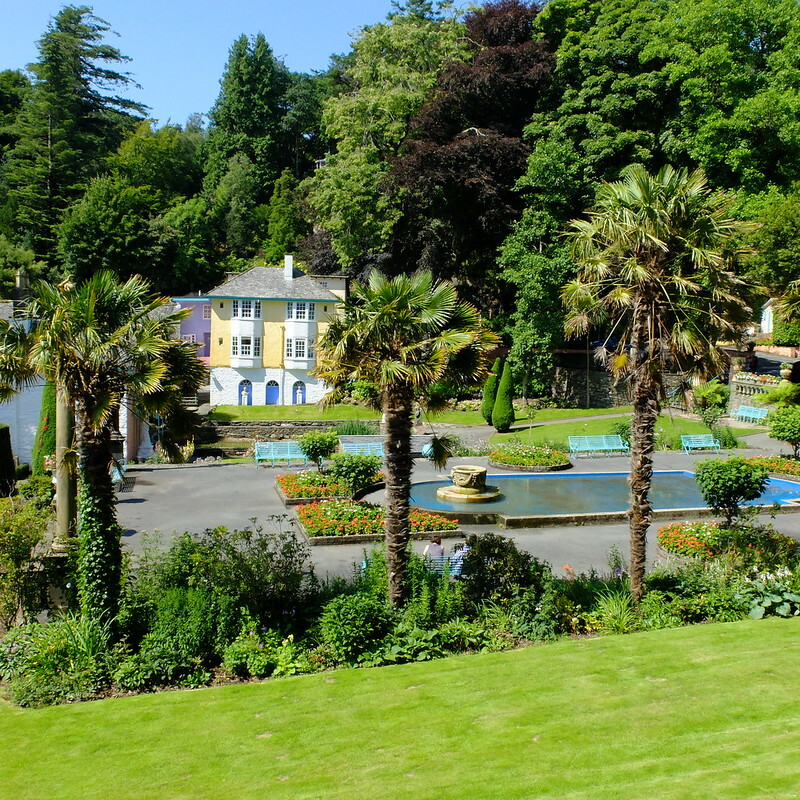 You'll never find anywhere else quite like Portmeirion. 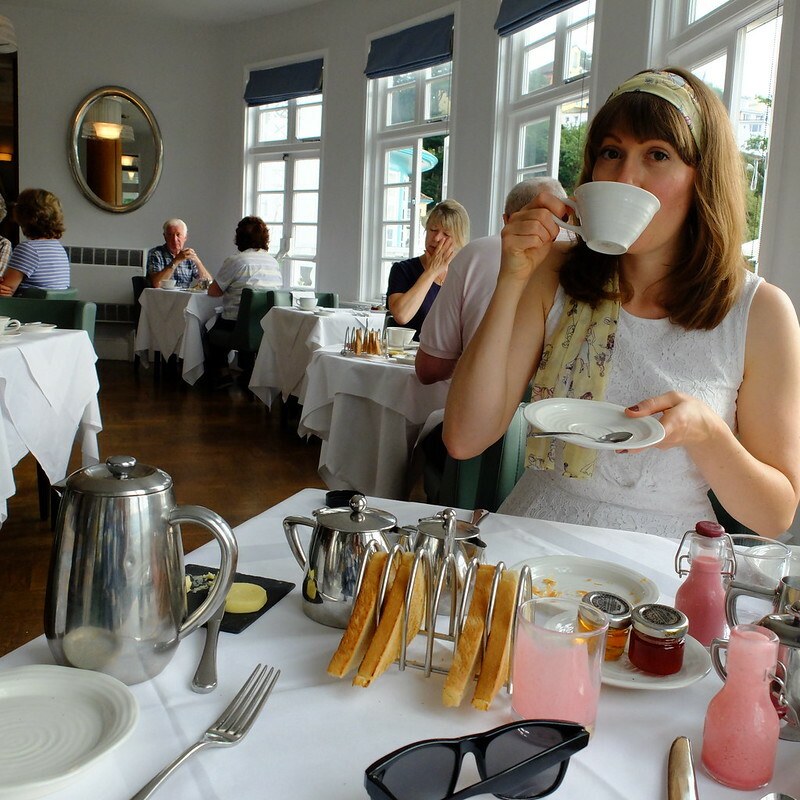 We paid £174 for the night, including breakfast, through Travelzoo. Wow that bed! I think my eyes are bleeding!! the rest looks lovely though. Looks like a lovely spot, although I can understand your distaste of the decor in your room. Judy's trades at Festival Number 6 but unfortunately it clashes with End of the Road. I'd love to go one year as it combines two of my favourite things, splendid architecture and live music. Oh, that room... You know, in another 20 years, if the decor lasts that long, people will be raving about how perfectly 90s retro it is. But yeah, very Changing Rooms. I sometimes wish the BBC would repeat one or two old episodes of Changing Rooms, just for nostalgia. 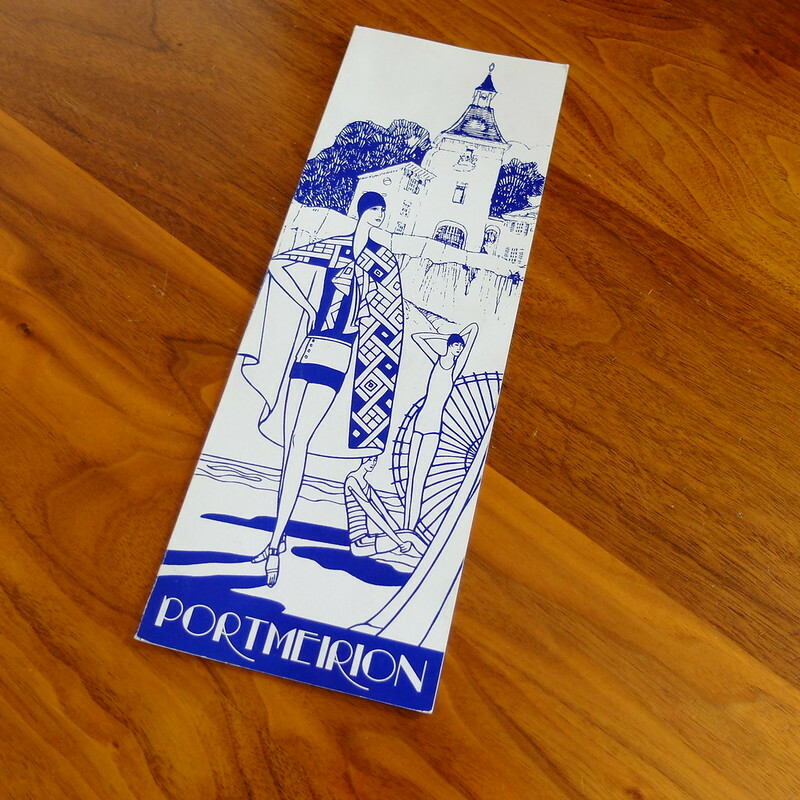 I am so envious of your stay in Portmeirion. As in, lots of bloggers go places and I think, "Oh, that looks nice, I'd like that," and then that's it, but this trip has me absolutely green with envy. I *love* The Prisoner, it's one of my favourite 60s TV series. 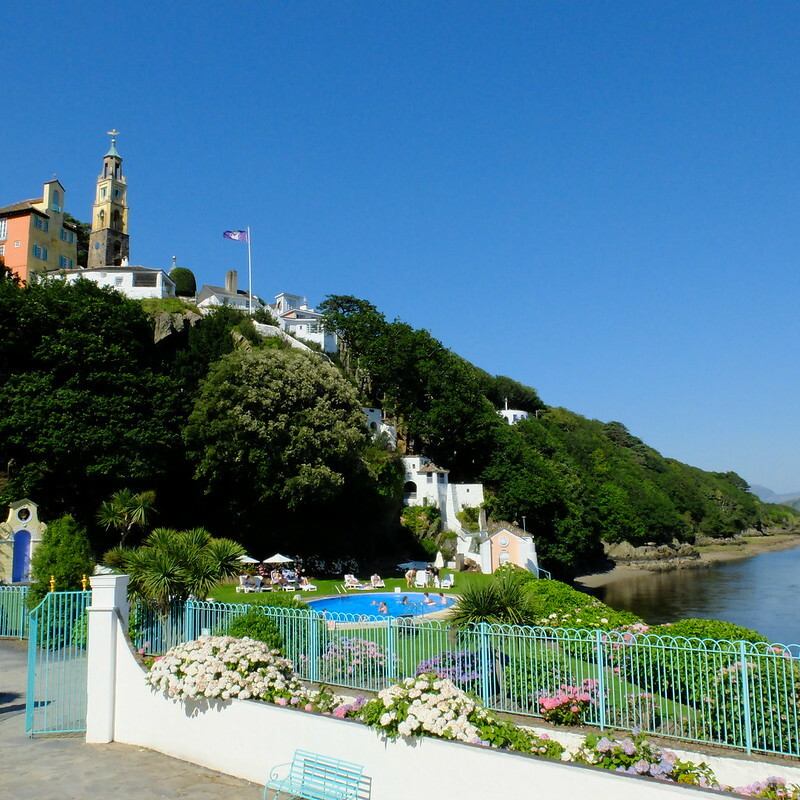 Husbeast has been talking about us going back to Burgh Island, but I might grovel at him for a trip to Portmeirion instead of it (or possibly as well). With those blue skies above, it does look just like it did in the show. Jokes aside, the rest of the sights were incredibly lovely. That village is off-the-charts pretty! I want to live here. I think I'm literally a heart eye emoji right now. I haven't been here for years, probably not since they decorated that room! It still looks lovely though, I must go again. Wow! 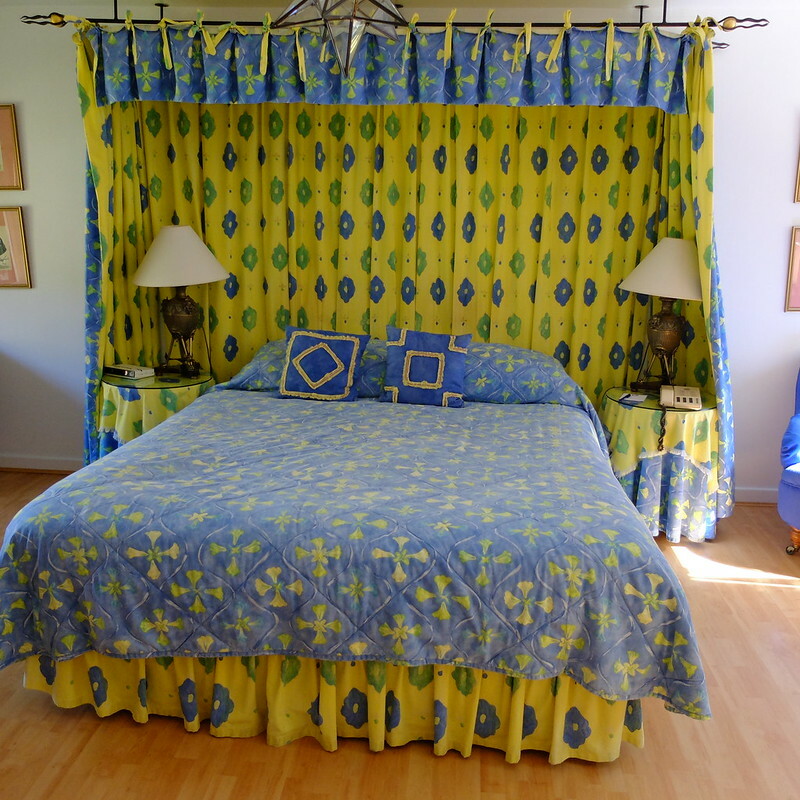 Yikes about the drapery and bedding in your room! It doesn't go at all with the rest of the place. At least everything else was gorgeous! Looks like it was great time away overall though for sure! Oh my god!!! I have been DYING to go here for years!!! 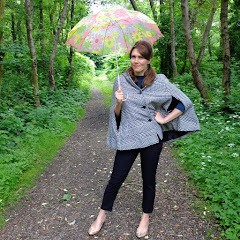 Not only is it amazing for all the reasons you said here, but one of my favorite TV shows filmed here, The Prisoner! Oh my, what an incredible place! I can just imagine Poirot having breakfast in that setting. That bedding is a very bizarre addition to an otherwise lovely place, doesn't seem to fit at all. Just shows you can't buy good taste. Wow! I didn't even know this existed. It's pretty darn cool. I have to say, maybe my memories of Changing Rooms are a bit rose-tinted, and it was a long time ago, but I'm not sure you are doing Laurence Llewellyn-Bowen justice by that comparison!